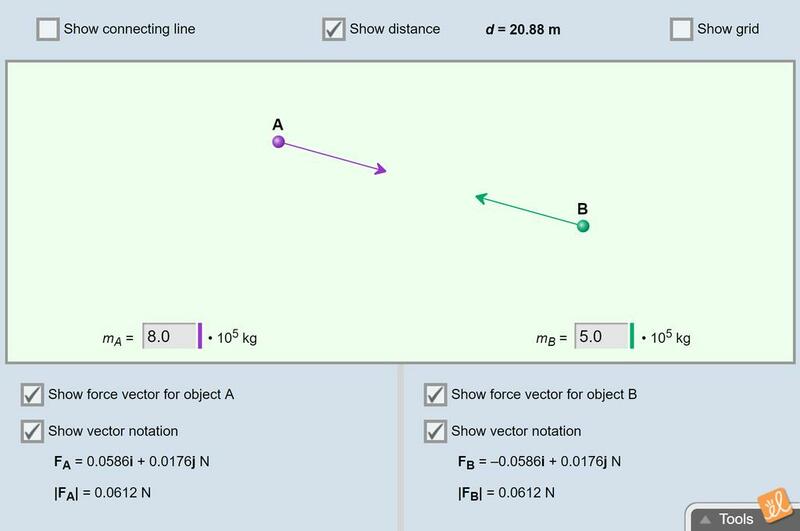 Drag two objects around and observe the gravitational force between them as their positions change. The mass of each object can be adjusted, and the gravitational force is displayed both as vectors and numerically. This has removed the some of the math calculations from the original unit to be used for students who are... (more) struggling with math skills. I use this as an introductory lesson to gravity. I have the students develop the concepts of how mass of... (more) objects and the distance between objects affect the amount of gravity between the two objects. Wonderfully adaptable & visual -- show as much or as little as you like. Hint at astronomy applications by entering planet or moon masses!